Above: A new blue plaque in Antrobus Village Hall commemorating John Wilkinson. The small Cheshire village of Antrobus was the birthplace and home of Sgt John Wilkinson, wireless operator in Vernon Byers’s AJ-K on the Dams Raid. The village held a special weekend of commemorative events on 6 and 7 May including a display at the War Memorial in the church, exhibitions about John Wilkinson, the Dambusters and Farming in the War. A special blue plaque was unveiled in the Village Hall. Highlights included a special Flypast by a Dakota from the Battle of Britain Memorial Flight to salute John Wilkinson and a display of model aircraft including an 11 foot Lancaster Bomber by the Liverpool Model Aircraft Society. The events also raised £1000 for the RAF Benevolent Fund. Below: Susan Sinagola of Antrobus presents a photograph of John Wilkinson to Mrs Phoenix of Antrobus Village School. 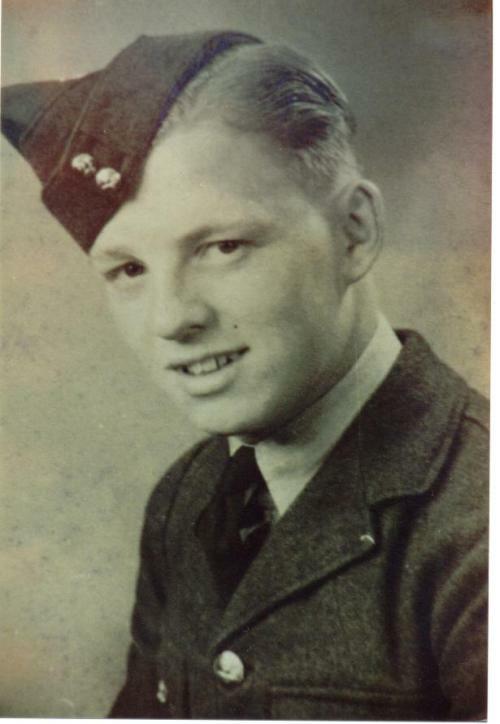 John Wilkinson was the wireless operator in Vernon Byers’s aircraft, AJ-K, on the Dams Raid. This was the third aircraft to take off on the night of 16 May, and the first to be lost. Off course, it crossed the Dutch coast at Texel Island, a well known flak position, and was shot down. This photograph was sent to me by John Cotterill, whose father was a good friend of John Wilkinson’s. It was given to him in 1993 by John Wilkinson’s brother, Tom, when the two met up for the first time in 43 years. I have also posted details on a new page on the Breaking the Dams website, which you can find here.